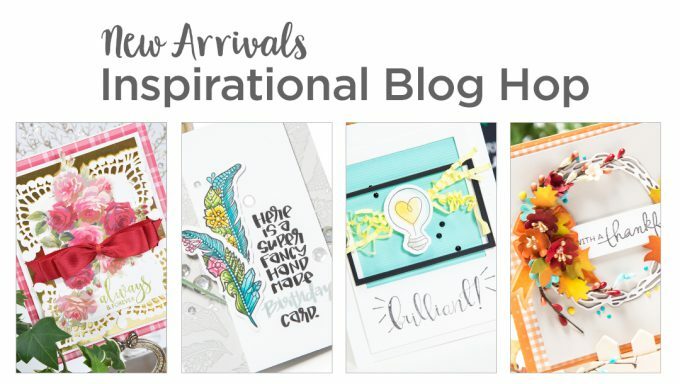 Hello everyone and thank you so much for joining us today for Spellbinders November inspirational blog hop! There are 4 new (very different!) collections being released this month. 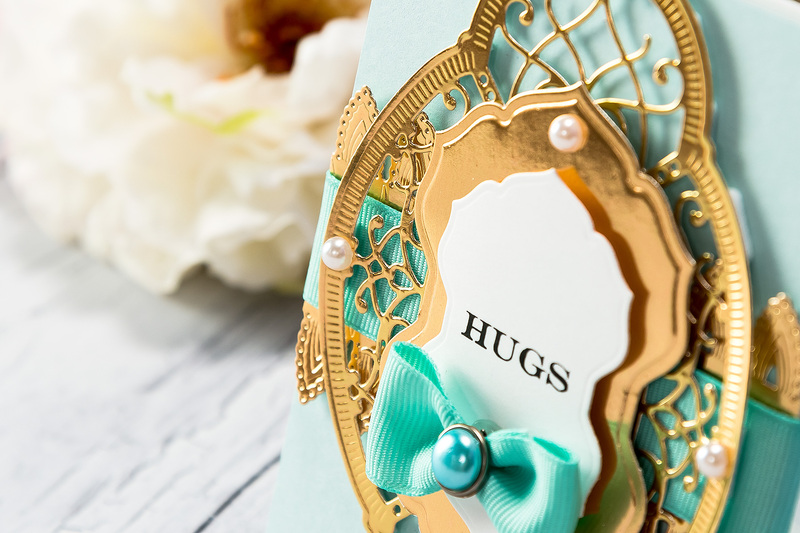 I picked the traditional style dies from Becca Feeken’s Chantilly Paper Lace collection to create the card I am sharing today. This is a standard size A2 card. I started working on this project by cutting a blue cardstock (I used Simon’s Sea Glass cardstock) to 4 ⅛ x 5 ⅜ “ and foam mounting it onto the base of my card. Next, I die-cut 2 large Flower/Border from the Lilly Pearl Flat Fold Flower/Border set out of gold foil cardstock. This die can be used to both make a border and a flower! So clever! I cut my borders to size and adhered onto the card. I picked some teal grosgrain ribbon and wrapped it around my card. Next, I die-cut & embossed the Outer Layer and Filigree Frame Layer from the Hannah Elise Layering Frame Small set out of gold foil cardstock. I always make a point of dry embossing my die cuts to have that extra detail added to them (and it always shows so nicely on any foiled cardstock). I foam mounted my elements onto the card. I also die-cut & embossed Medium Label from the Breanna’s Corset Label set out of gold foil cardstock and foam mounted it onto the card. Finally, I cut & embossed Small Label from the Breanna’s Corset Label set out of white cardstock, stamped a simple Hugs sentiment in black ink and foam mounted it onto the card. I made a little bow out of the same ribbon I wrapped around the card, added a blue pearl brad and adhered it in place. I also embellished my card using white self adhesive pearls. I also have one $25 gift card to give away to one lucky hopper! For your chance to win, please leave a comment below and let me know if you like to dry emboss with your Spellbinders dies. I’ll pick a winner on Sunday, November 26th and will announce here in this post. The winner is Beverly Jordan. Congratulations! Beverly, I emailed you. Spellbinder dies are spectacular and this is no exception. Your card is stunning, love the layering and colors. A rich and elegant card. Lovely card design. Great color combination for the set of dies you used. Thanks for sharing. I haven’t tried dry embossing with Spellbinders dies yet – but this definitely had peaked my interest! Love the color scheme on this card; the design really makes the dies shine. I do love your style. Thanks for the inspiration. I’ve never done any dry embossing with my dies. I’m not sure why. I think the results are very pretty. 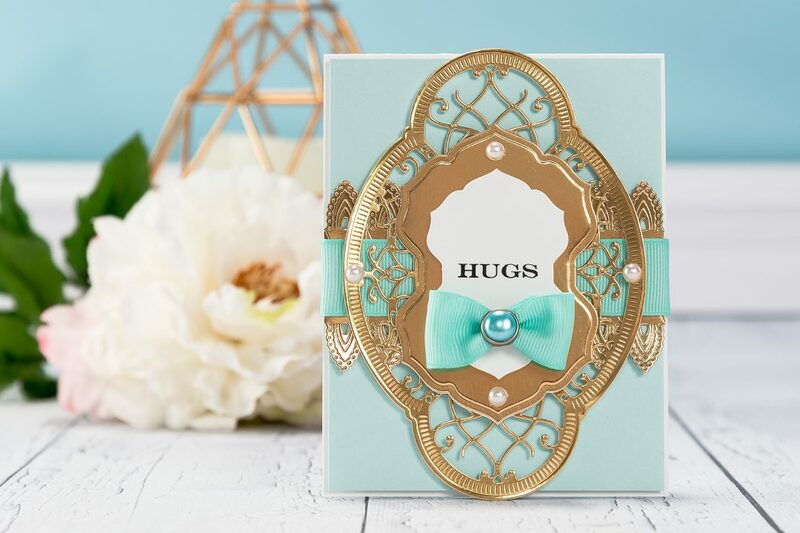 Yana, your teal and gold cards are so pretty! They are very appealing to my eyes! I really enjoy how you make these different dies work for you. 🙂 TFS on the blog hop. Very elegant card, I like the colors used. Such an elegant card, Yana. I love the gold and aqua together. What a STUNNING card!! I love the colors you chose and that little bow is just the cutes!! A very striking card! I am fond of the colors! Love the gold and teal combination! Yana, this is gorgeous!!! 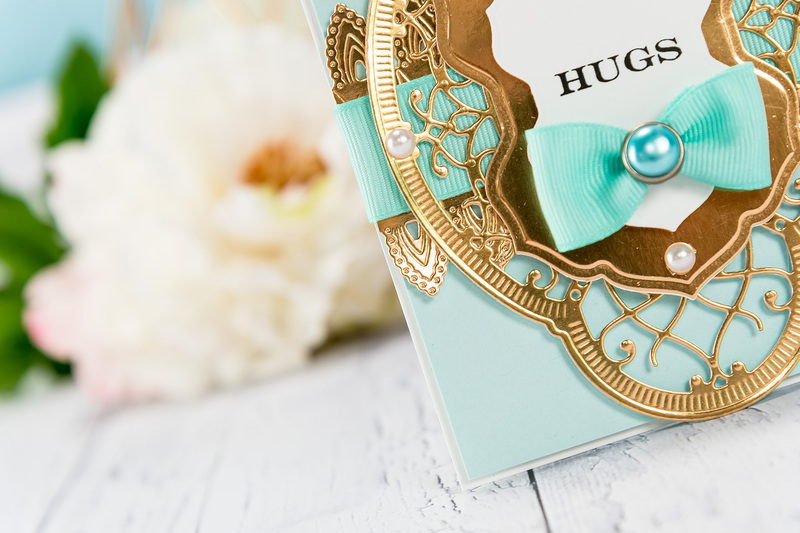 Love the Tiffany Teal and Gold together! Gorgeous design and great dry embossing. And working at Spellbinders must be wonderful!! I have not tried dry embossing with my dies yet. Your card is lovely – love the gold. Beautiful card. I love the colors together. Super elegant card. Love gold and white combination. Very pretty and elegant Yana. Love the gold with the blue. Beautiful card. The color combination is especially pretty! I am crazy in love for all the projects you create Yana. You are so talented and I always come away with tons of inspiration. Thanks! Oh, this is such a beautiful new collection! I love what you’ve created.. So very lovely. Spellbinders has such beautiful, intricate dies. Seeing the projects you create with them makes me want them all. This card is gorgeous. Beautiful card. Love gold and blue together! Yana, I will sum it up like this, I have been following you for a long time now and I think this is my FAVORITE card from you!! Stunning, I LOVE it. I love your colour scheme. It’s amazing what gold cardstock can do to a card. This is gorgeous! My favorite colors. I find dry embossing with dies a hit or miss kind of thing so don’t do it often. Mmmm! I just love the rich elegance of that die set and your gorgeous card with it! Those color choices together are perfect! I love the color combo and the clean lines of your card. Oh my ! This card looks like a jewel ! This card is just exquisite and I love to dry emboss with my Spellbinder dies as well. That’s one aspect of them that I really enjoy! I haven’t done too much dry embossing with Spellbinder dies but love that you have that capability. 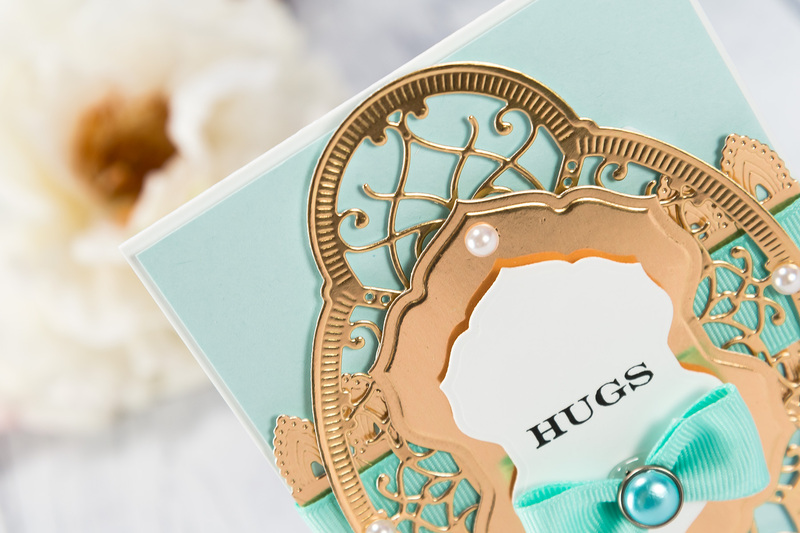 Your cards are so beautiful and the metallic gold with pale blue is elegant. Beautiful design. It’s so elegant. Wonderful card! I have not tried dry embossing with my dies yet. But I love the look so will have to try it. It’s one of those techniques that I never think to use, but I do like it!